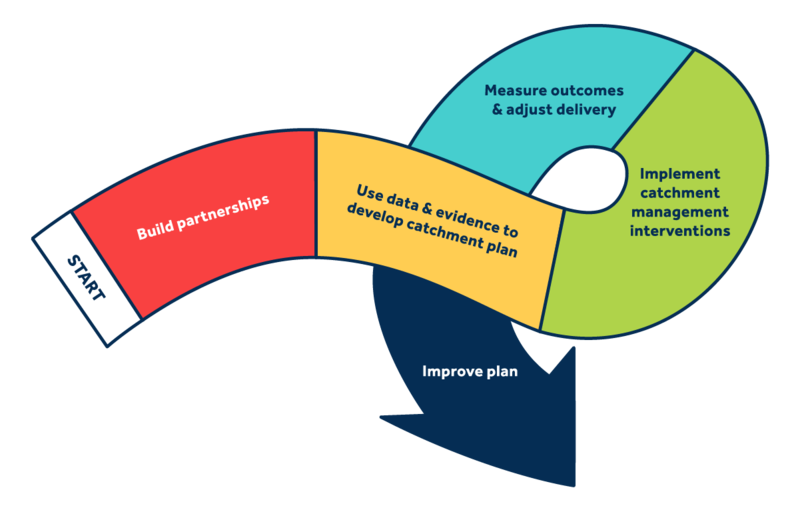 A CaBA catchment plan will establish a strong framework for collaborative working to deliver integrated catchment management and will develop as the catchment partnership grows and becomes sustainable. Integrated catchment management can provide multiple benefits for all the partner organisations and the local community, including reducing flood risk whilst also cleaning up pollution, protecting drinking water resources, improving biodiversity and improving the health and recreation for local communities. Planning integrated, collaborative actions will be more cost-beneficial than projects tackling single issues, as the partners can share the cost burden, whilst still meeting their own objectives. The CaBA workflow follows a natural capital approach consistent with the natural capital workbook. Building partnerships takes time and a lot of effort. It is the foundation for collaboration and there is no short cut. Trust built here will pay dividends later when partners write joint funding bids and the local community is supportive. CaBA partnerships use engagement tools and techniques to bring stakeholders together, set a vision and agree priorities. CaBA partnerships make use of the best available data and evidence to develop a shared understanding of the issues and to target their actions and funds where they will have multiple benefits for all the partners. For example, a well-targeted habitat restoration project can benefit wildlife, but can also reduce flood risk downstream, improve drinking water quality and provide social, health and recreation benefits to local people. Understand where you are starting from. This includes the baseline position of the various assets; plans and activities already in place; information about any other activities that could have a beneficial or adverse impact on the environment. Use the “Where are the opportunity areas for action?” from the data package. Build the evidence base.You will need to understand the extent and condition of the natural capital and other assets within your area and its associated benefits. Use the “Where are the well-known issues in the catchment?” And “What are the key characteristics of the catchment” from the data package. Identify and weigh up your options.This is where spatial data, environmental and economic modelling and valuation, and environmental management come together to form the basis for a plan. At this stage you can often generate new and better options than those considered earlier. The potential prize is a set of outcomes which add up to more than the sum of the existing approaches, creating new value and opportunities. Use the “What are the possible causes of problems?” from the data package and “What is already going on to improve my catchment” from the data package V5 which will be released soon. The CaBA Data Package provides a good base level of data for all three stages of the evidence base. The CaBA Data User Guide identifies some of the most useful additional data that can be added from local sources within your catchment to compliment the basic package and turn it into a “Local Evidence Pack” that is specific to the priorities and characteristics of your catchment. A database of ‘shovel ready’ projects. These are projects which the partnership has agreed will contribute to the vision. All that is required is some funding! These projects can be delivered opportunistically as funding becomes available. Flagship projects. These are major projects which will make a step change to the natural, social, physical & financial and human capital of your catchment. They are designed to capture the imagination and enthusiasm of the people who live and work in the catchment. Partnerships who record the ‘natural assets’ that they are creating will be able to value and maintain the improvements they have made. Does the project improve the catchment in the way we thought or wanted it to? This is not easy to do. It is expensive, takes a long time and there is rarely any specific budget for it. However, the value of this monitoring is enormous if it is locally commissioned, conducted and analysed. Local universities and citizen science have a key role in making monitoring a central part of CaBAs work and complimenting the regulatory monitoring that is done by government agencies. CaBA provides a unique opportunity to improve the catchment plans through peer to peer learning and mentoring. The CaBA Discussion Forum; annual conferences and the mentoring program can be used by all partnerships to share learning and build capacity.